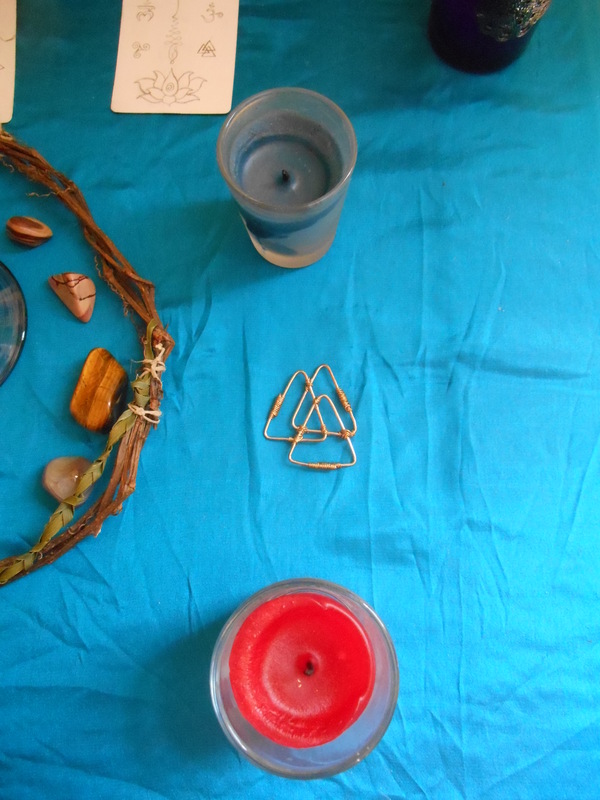 Since last night was the new moon, I decided to finally set up my Beltane altar. 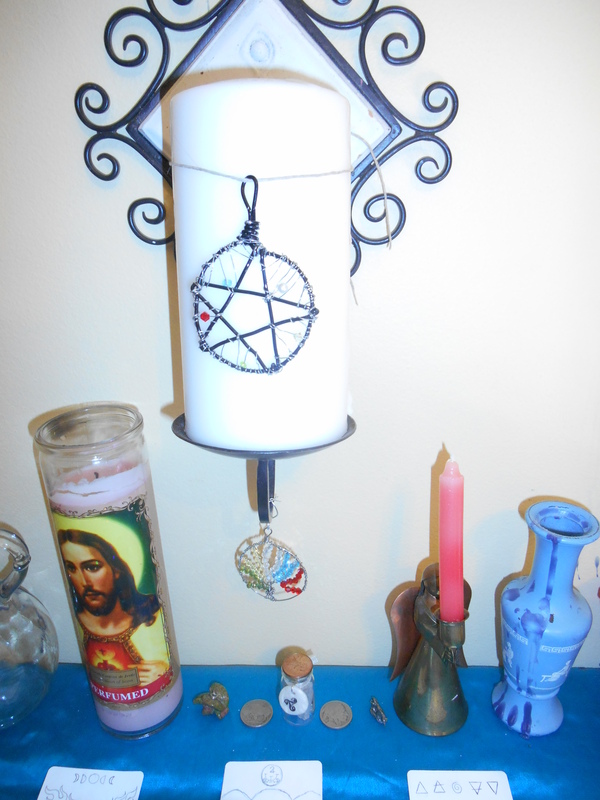 I like to keep my altar simple, even for Sabbats, otherwise it just feels cluttered. 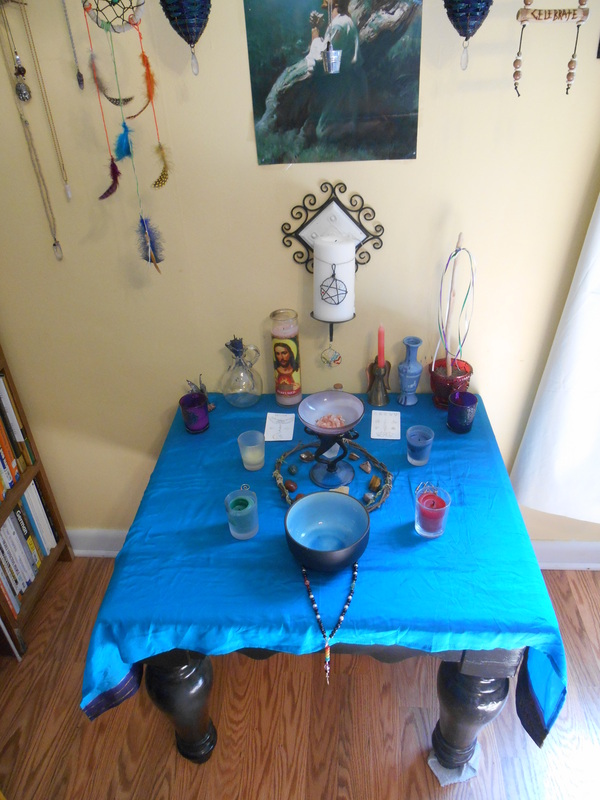 I didn’t add a lot of decorations, I went mostly for symbolism because I like to keep the same altar even after a Sabbat. Beltaine: Beltaine (“Bright Fire”) is one of the Solar Festivals and honors the Celtic God known as Belinus. In ancient times, tribal herds were ritually driven between bonfires during this festival, so as to purify and protect them in the upcoming year, prior to their being taken to the pasture lands for the Summer. 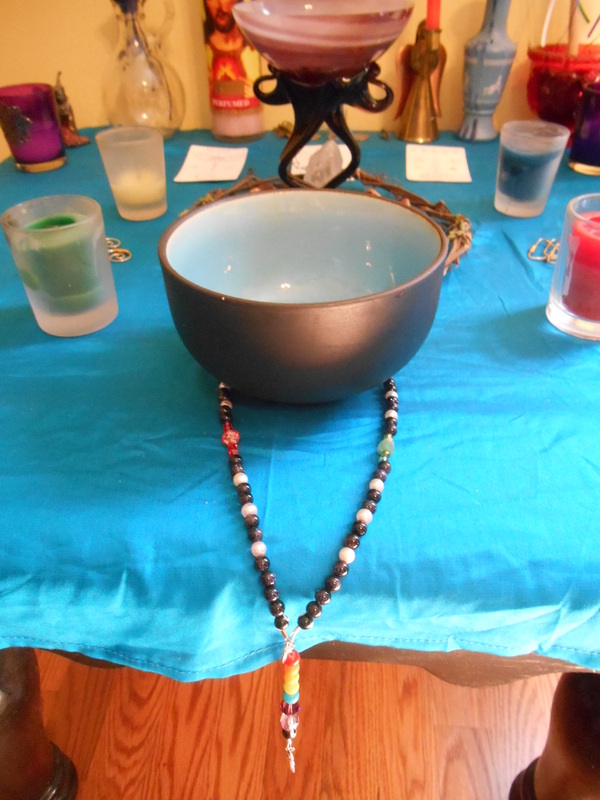 My new ‘cauldron’ and my prayer/meditation beads I made. 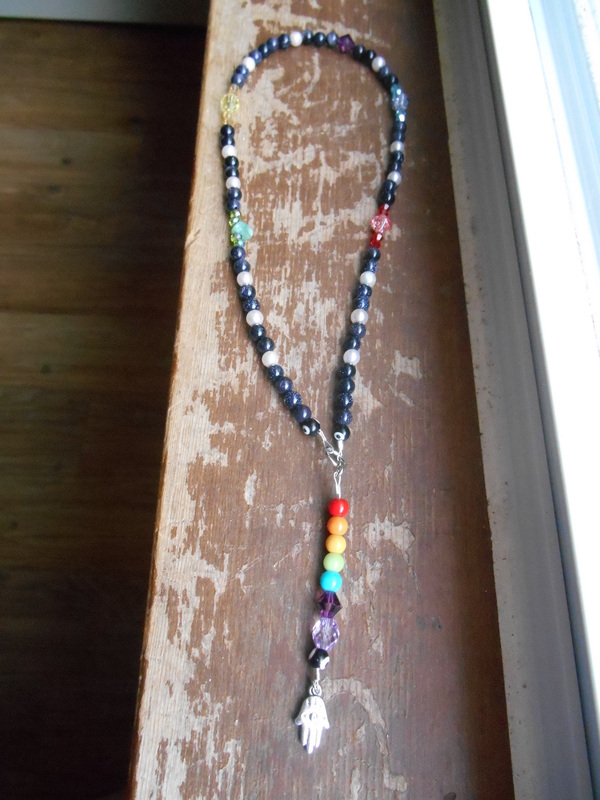 Prayer/meditation beads: There are 13 white beads for the 13 moons; green, yellow, purple, blue, & red beads for the 5 elements (earth, air, spirit, water, & fire). 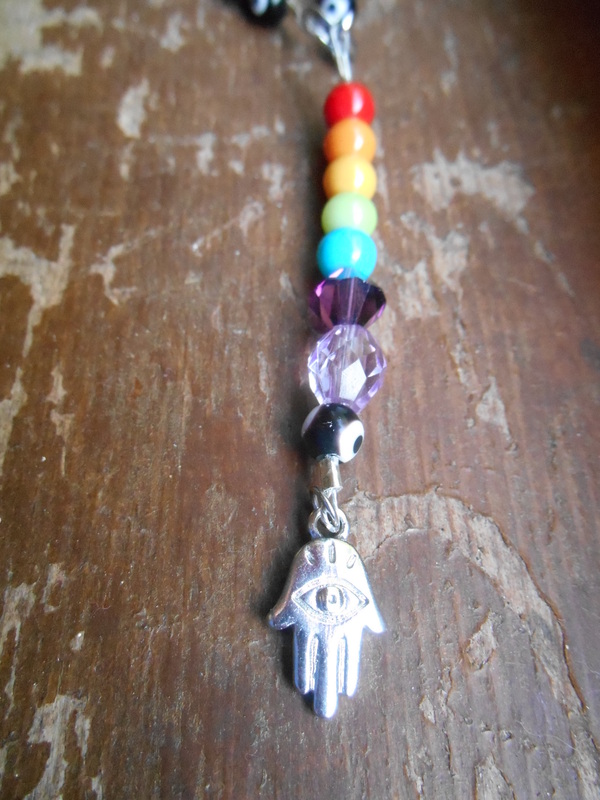 On the hanging down part; 7 beads for the 7 chakras and a hamsa hand bead. 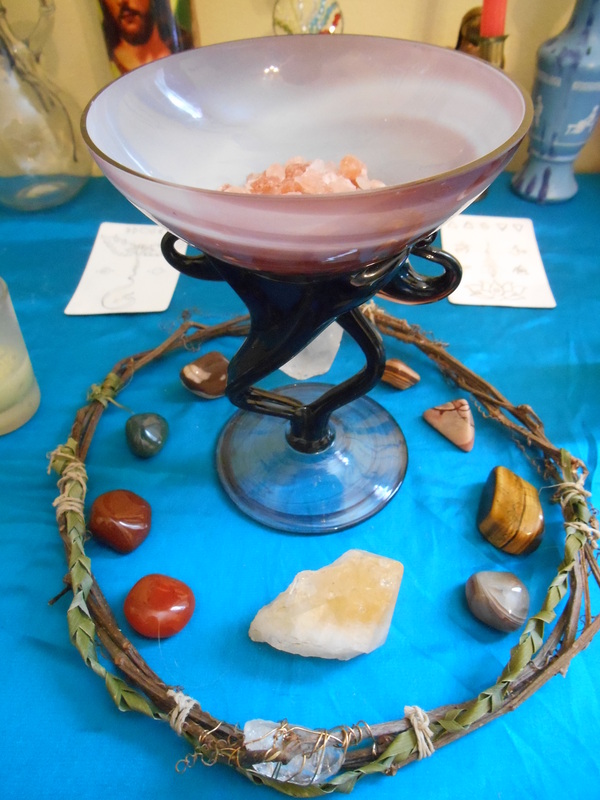 In the center I put a Himalayn Pink Salt in a fancy dish surrounded by all the gemstones I have that are associated with the element fire. I also put my clear quartz crown around them. 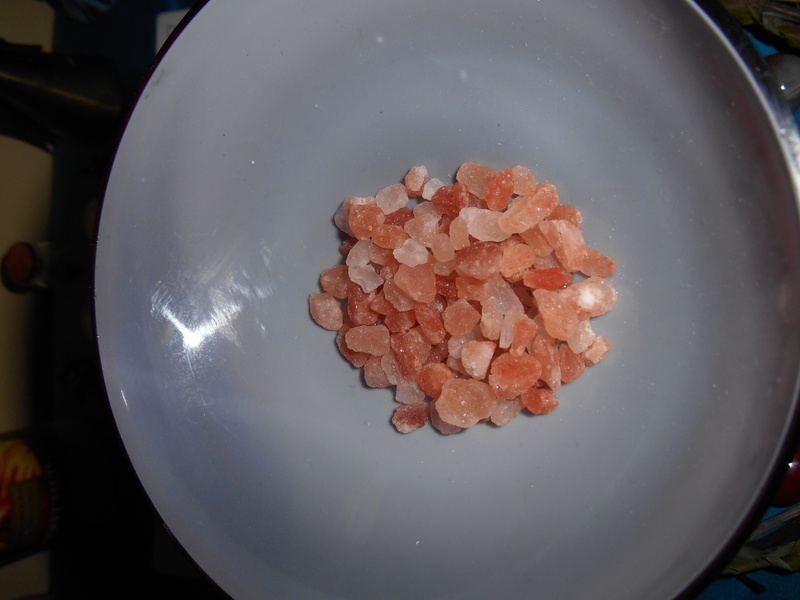 The colors look like fire and salt represents purification and protection. 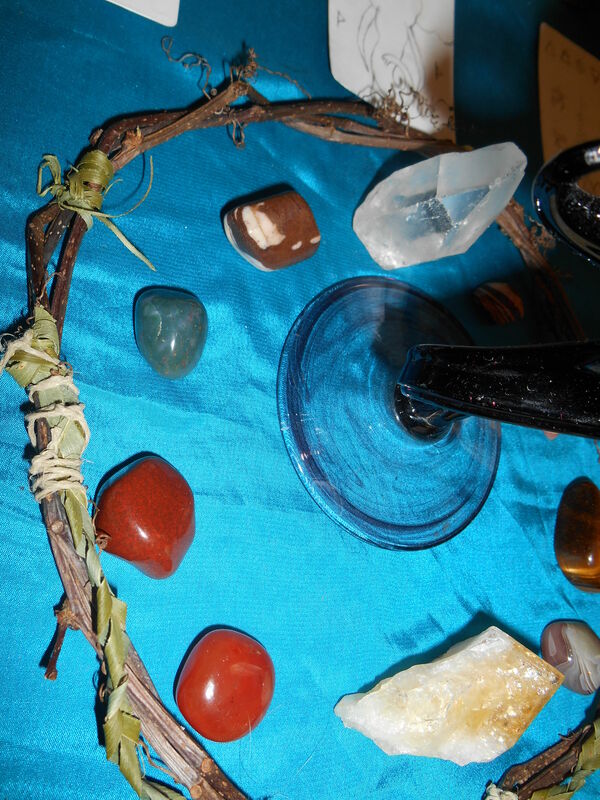 Clear quartz, zebra jasper, bloodstone, red jasper, carnelian, & citrine. Two more zebra jaspers, tiger’s eye, and botswana agate. 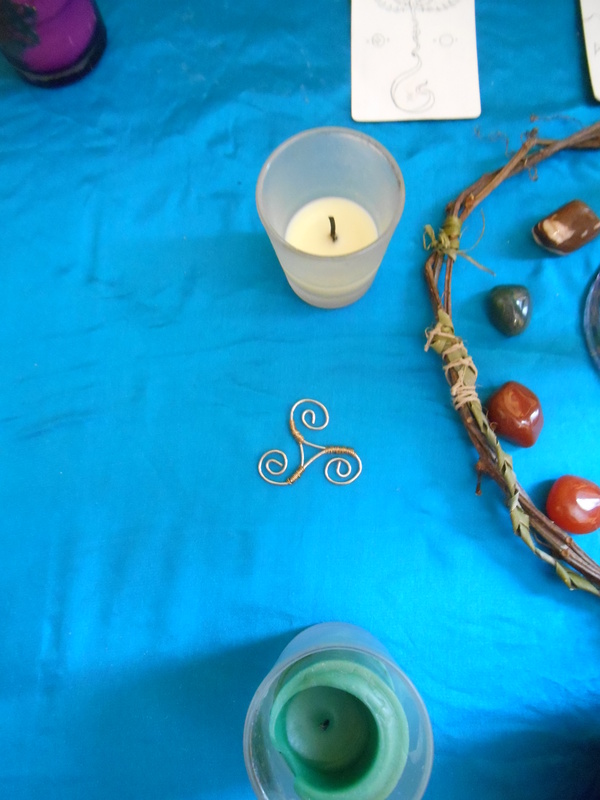 My usual element candles and my triskele that I always keep on my altar. My wire Valknut that’s also a permanent fixture. My Maypole. 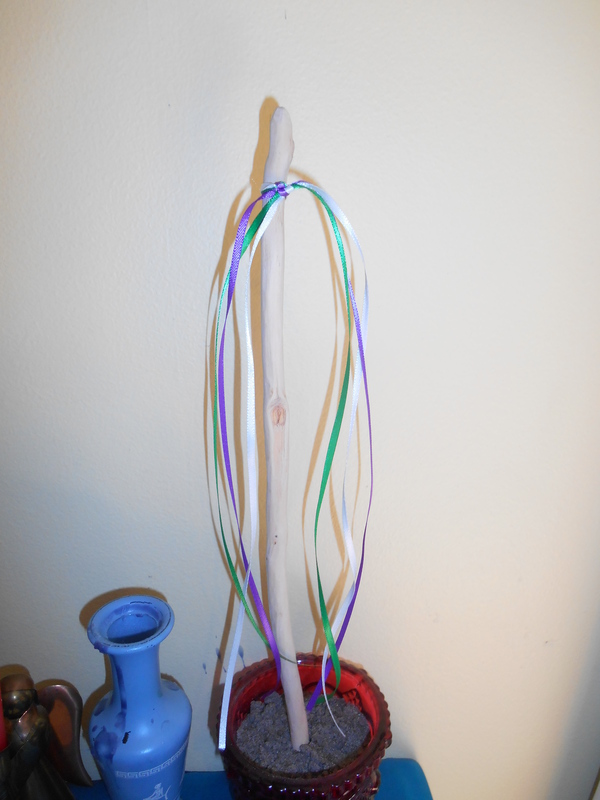 The ribbon colors aren’t really ‘Beltane colors’, but they’re all I had so whatevs. Each ribbon is a wish. 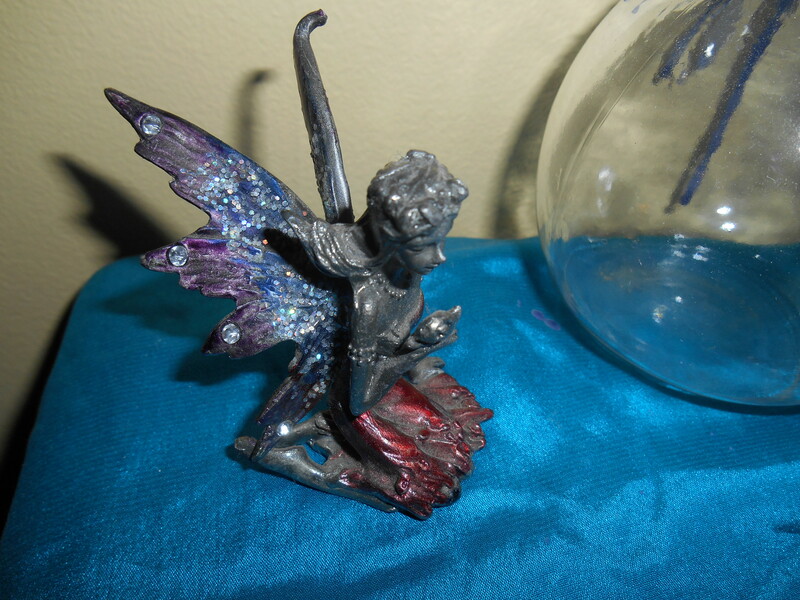 A fairy that I just found in my stuff one day. Not sure where it came from. White candle that’s a permanent fixture and represents spirit. Pentacle pendant I made a while ago and my tree of life pendant I also made. 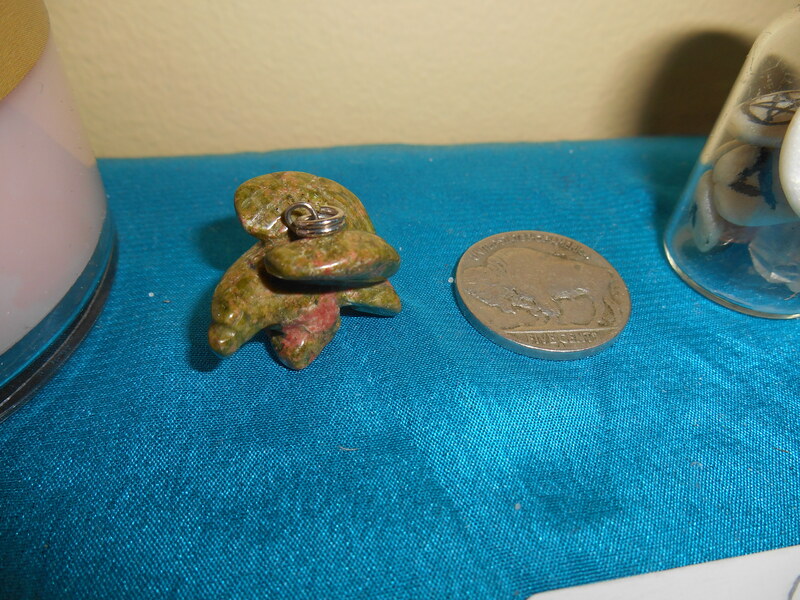 Unakite is good for overcoming obstacles in personal growth. 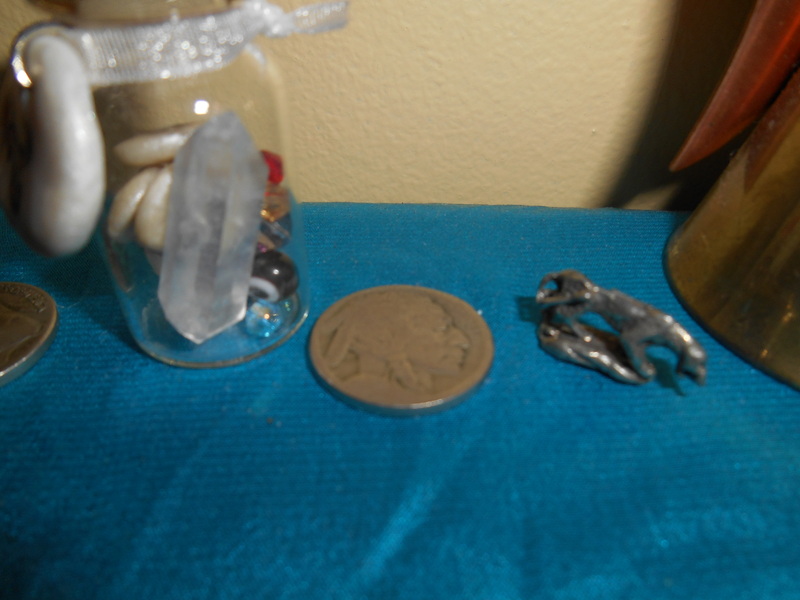 My New Beginnings bottle, buffalo nickel, and pewter panther. The panther is my Spirit Guide. The little ‘trinkets’ below my tree of life pendant from left to right; Unakite eagle pendant, buffalo nickel for luck, my New Beginnings bottle, another buffalo nickel, and a pewter panther. The three cards are my New Moon goals/desires/things I’m working on. The new moon is the perfect time to write down your goals and desires to work on until the next full moon or until you accomplish them. I decided to draw mine out since these are things I will be constantly working on and hoping for. 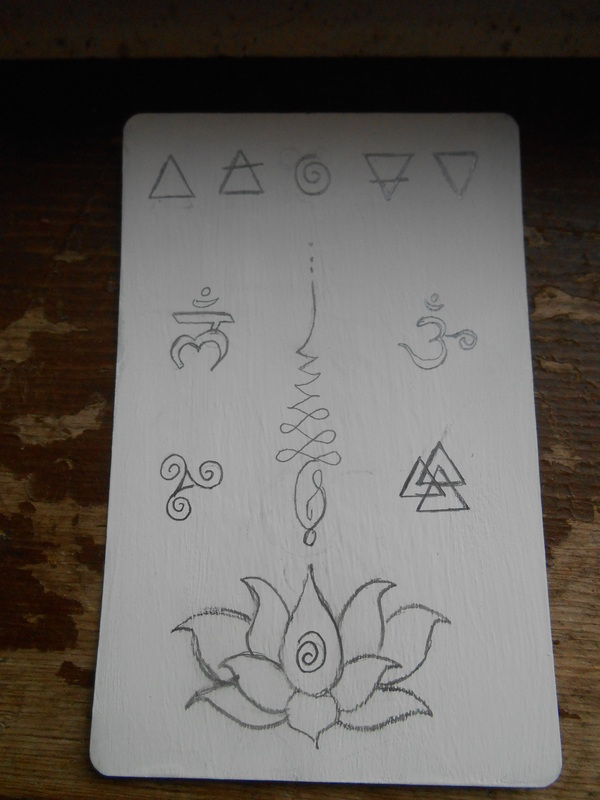 I painted the front of playing cards white and then drew my intentions on them. I’m going to paint them thought the week. This one is for luck and career success. In Hindu culture, elephants represent luck. 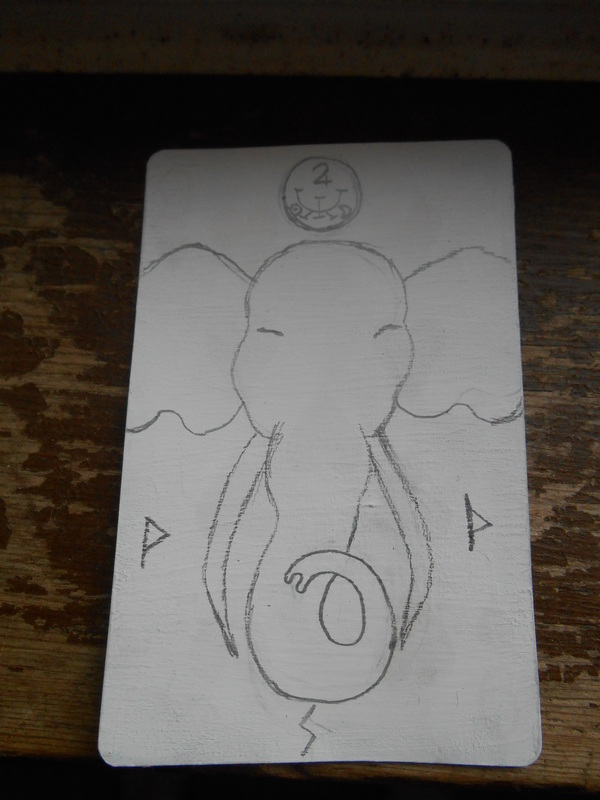 Above the elephant’s head is a prosperity sigil, with 3 Elder Futhark Runes. 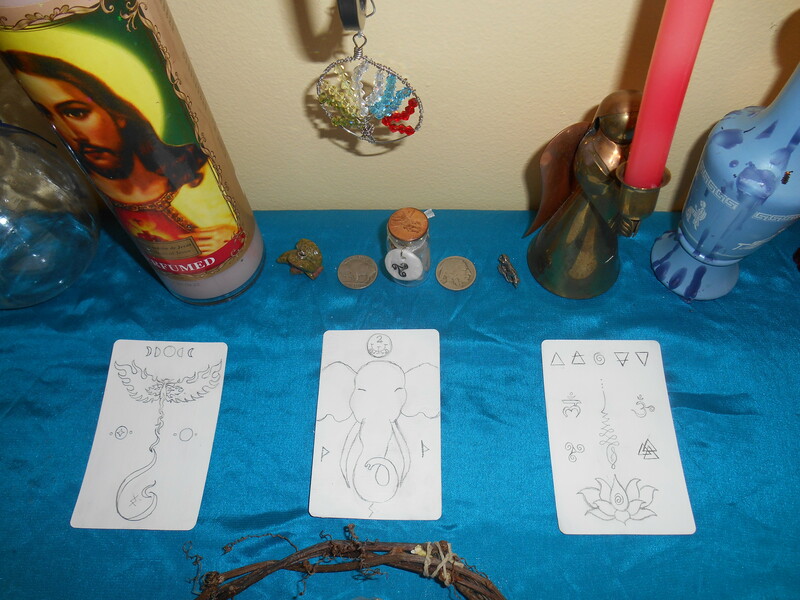 From left to right; Wunjo– Joy & accomplishments in love or career, Sowelo– Wholeness, success, good health, Thurisaz-Good luck, protection, unexpected opportunity. I made this one because I am about to start my new job- booth renting a hair styling studio. It’s been about 7 months since I’ve done hair so I’m basically starting from scratch. I’ve just been worried that I’m putting in more money than I’ll make or that it will take a long time to build a clientele and I won’t be able to pay my bills. The phoenix is reborn from its ashes. It represents rebirth and renewal. 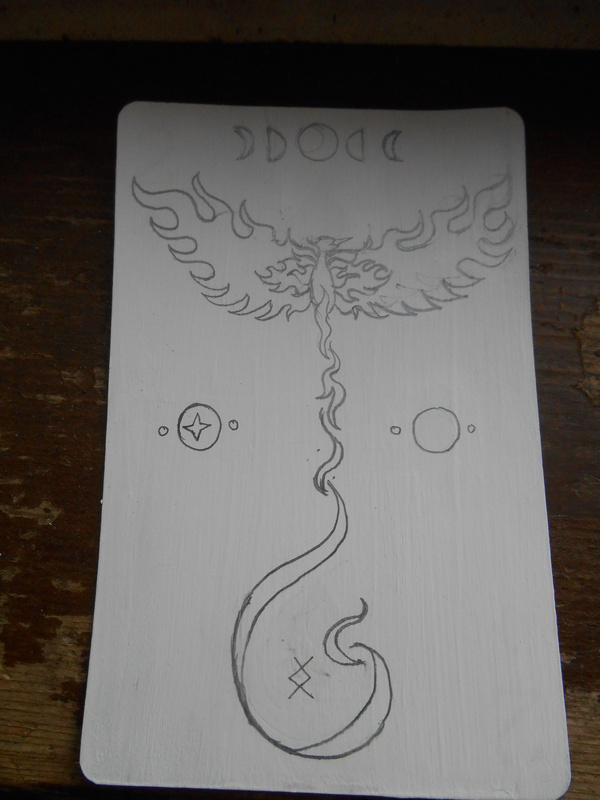 I also drew the phases of the moon; the moon also represent renewal. On the left and right are lunar symbols and an Inguz rune for successful completion with new starts. I drew this one because I want to start over. I’ve been going throw some things and trying to rid my life of a few negative habits I picked up [they’re too personal to post]. 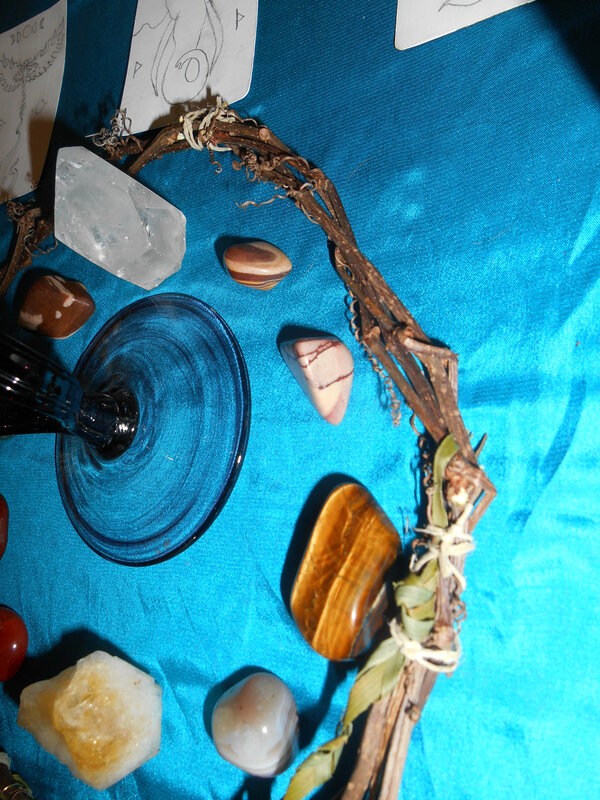 This one is for spiritual growth. The lotus flower with an unalome. The unalome symbol is a representation of reaching enlightenment. The path starts in the center of the spiral, and as you continue down this path you are wandering, becoming more conscious of your surroundings. When you reach the top of the symbol (the straight line), you have reached enlightenment. A triskele, valknut, chakra symbols for the chakras I want to work on repairing, a spiral (representing winding inward journey) and the symbols of the four elements. These are long term goals I will be working on and constant desires. What are some goals you’re working on?